As we enter into the Christmas season this year, we once again are hearing about complaints and threats of boycotts against companies and malls that continue the trend of removing traditional and even non-religious symbols of Christmas from their stores and retail spaces. Though this might be disappointing and even ridiculous as to why anyone would be offended by a nativity scene or a Santa parade, it really should not come as any surprise. Jesus clearly stated that since the world hated Him, the world would also hate those who belong to Him, and by extension anything that, religious or not, communicates Christmas (see John 15:18). This shows that even the world knows you really can’t remove Christ from Christmas. Fortunately, there is a better and truly sustainable way to get the message about Christ and the true message of Christmas out into the stores and malls. It the same method that has worked without fail from the time the Church came into existence. The method is to simply let the message about Christ, in all its richness, fill our lives. Also, remember and be encouraged because the Gospel (the Good News) and the message of Christmas is…. The only message that has the power to liberate people, families and nations from slavery to sin and the powers of darkness. It’s the only message that causes mercy to triumph over judgment. It’s the only message that brings sight to the blind, and hearing to the deaf. It’s the only message that brings healing to the sick and handicapped. It’s the only message that heals the broken-hearted. It’s the only message that brings a joy that this world cannot rob you of. It’s the only message that brings life to where death once has reigned. 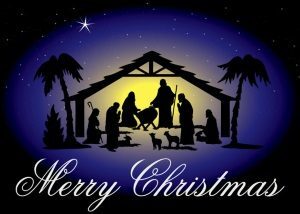 May God abundantly bless you this Christmas!